Until now, three different methods of extraction out of the stretcher ring have been used successfully (depending on the needs of the particular experiment). We started with the resonance extraction method, which was supposed to produce the highest external current. The aim was a smooth beam at a constant rate without intensity bursts which decrease the microscopic duty factor. To achieve this, we first had to compensate the ripple on the magnetic power supplies with the help of active and passive filters. The resonance extraction is based on the fact that the horizontal amplitude of betatron oscillations can be increased by shifting the machine tune towards a resonance. To get a high extraction efficiency the amplitude growth of the electrons per turn should significantly exceed the thickness of the extraction septum. This process can be supported by additional multipole fields, which excite the resonance and therefore lead to an increase of the amplitude. In the case of the third integer resonance, a sextupole field can be used. For ELSA the third integer resonance 14/3 has been chosen. In the stretcher mode of ELSA, a certain sextupole strength is applied permanently, which defines the resonance strength. The tune is kept 0.015 units away from the resonance during the injection time, so that all electrons moving with small amplitudes are in a stable phase space area. The extraction is started by activating four extra ironless quadrupole magnets which shift the tune towards the resonance. This causes the stable phase space area to shrink, and more and more particles become unstable and get extracted. In the stretcher mode the extraction time equals the cycle time of the injector, which is 20 ms. The extraction magnets (four sextupole magnets and four ironless quadrupoles) are placed in the dispersion-free sections of ELSA (this way the sextupoles do not affect the machine chromaticity). Two septum magnets are used to steer the particles out of the machine. Long-term drifts of the power supplies in the order of 10-5 still influence the quality of the extracted beam and require small corrections of the machine settings. A considerable improvement of the long-term stability has been obtained by a computer controlled optimization of the change of the tune shift in time. For the ELAN (electron scattering) experiment a reliable and stable external beam of 50 nA and a duty factor of 60% was provided using the described extraction method. For experiments which need higher beam energies than can be delivered by the injector, the same extraction method is being used, with the difference that before ramping the energy and extraction successive pulses from the injector synchrotron are accumulated in the stretcher ring (booster mode). The circulating current in the stretcher ring after this accumulation period typically is about 50 mA. For ramping up the beam energy a time of some 100 ms is needed. At high energy the electrons are extracted by moving the horizontal betatron tune towards the 14/3 resonance and exciting the sextupoles dedicated for extraction. The four ironless quadrupoles are used to keep the extracted current constant. Typical extraction times lie in the region of 1 to 30 s, depending on the required intensity of the extracted current. The resulting macroscopic duty factor lies in the region of 75% to 95%. Recently a direct feedback system has been installed which can counter short-term fluctuations as well as long-term drifts of the extracted current. For the finished PHOENICS experiment (which used tagged photons up to 1.2 GeV) a different extraction method was used. A small vertical Beryllium wire was placed in a dispersion-free section near to the closed orbit about 20 m upstream of the extraction septum. The stretcher ring was working at a fixed tune near the 14/3 resonance. Electrons hitting the wire were deflected by successive multiple scattering. This extraction method is much less sensitive to power supply ripple than the resonance extraction method. The intensity, however, is limited to about 150 pA with a wire thickness of 50 micrometer, which was sufficient for PHOENICS. 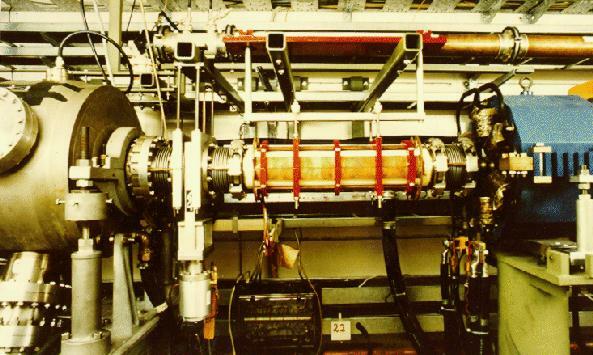 A stable external beam with a duty factor of up to 80% could be obtained during several runs without changing any parameter of the accelerators for days. However, this extraction method produced a lot of stray particles in the area of the wire and thus is no longer being used. Also, another extraction process was used for some time, where a ramping of the rf voltage instead of the betatron tune was applied to control the extracted current. This works when the betatron tune is put on a synchrotron side band of the resonance, where the horizontal motion of the particles is coupled to the longitudinal motion. But in general there is no advantage compared to the normal extraction method using a tune ramp.